Steel is a metal alloy whose major component is iron, with carbon content between 0.02 and 1.7 percent by weight. Carbon is the most cost-effective alloying material for iron, but many other alloying elements are also used. Carbon and other elements act as a hardening agent, preventing dislocations in the iron atom crystal lattice from sliding past one another. Varying the amount of alloying elements and their distribution in the steel controls qualities such as the hardness, elasticity, ductility, and tensile strength of the resulting steel. 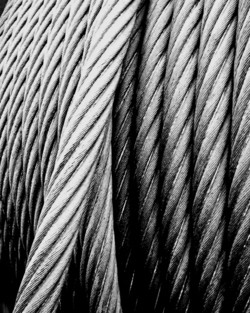 Steel with increased carbon content can be made harder and stronger than iron, but is also more brittle. 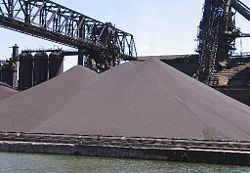 The maximum solubility of carbon in iron is 1.7 percent by weight, occurring at 1,130° Celsius; higher concentrations of carbon or lower temperatures will produce cementite, which will reduce the material's strength. Alloys with higher carbon content than this are known as cast iron because of their lower melting point. Steel is also to be distinguished from wrought iron with little or no carbon, usually less than 0.035 percent. It is common today to talk about “the iron and steel industry” as if it were a single thing—it is today, but historically they were separate products. Currently there are several classes of steels in which carbon is replaced with other alloying materials, and carbon, if present, is undesired. A more recent definition is that steels are iron-based alloys that can be plastically formed (pounded, rolled, and so forth). Iron, like most metals, is not found in the Earth's crust in an elemental state. Iron can be found in the crust only in combination with oxygen or sulfur. Typically Fe2O3—the form of iron oxide (rust) found as the mineral hematite, and FeS2—Pyrite (fool's gold). Iron oxide is a soft sandstone-like material with limited uses on its own. Iron is extracted from ore by removing the oxygen by combining it with a preferred chemical partner such as carbon. This process, known as smelting, was first applied to metals with lower melting points. Copper melts at just over 1,000 °C, while tin melts around 250 °C. Steel melts at around 1,370 °C. Both temperatures could be reached with ancient methods that have been used for at least six thousand years (since the Bronze Age). Since the oxidation rate itself increases rapidly beyond 800 °C, it is important that smelting take place in a low-oxygen environment. Unlike copper and tin, liquid iron dissolves carbon quite readily, so that smelting results in an alloy containing too much carbon to be called steel. Even in the narrow range of concentrations that make up steel, mixtures of carbon and iron can form into a number of different structures, or allotropes, with very different properties; understanding these is essential to making quality steel. At room temperature, the most stable form of iron is the body-centered cubic (BCC) structure ferrite or α-iron, a fairly soft metallic material that can dissolve only a small concentration of carbon (no more than 0.021 percent by weight at 910 °C). Above 910 °C ferrite undergoes a phase transition from body-centered cubic to a face-centered cubic (FCC) structure, called austenite or γ-iron, which is similarly soft and metallic but can dissolve considerably more carbon (as much as 2.03 percent by weight carbon at 1,154 °C). 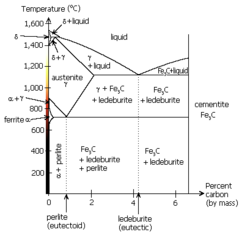 As carbon-rich austenite cools, the mixture attempts to revert to the ferrite phase, resulting in an excess of carbon. One way for carbon to leave the austenite is for cementite to precipitate out of the mix, leaving behind iron that is pure enough to take the form of ferrite, and resulting in a cementite-ferrite mixture. Cementite is a stoichiometric phase with the chemical formula of Fe3C. Cementite forms in regions of higher carbon content while other areas revert to ferrite around it. Self-reinforcing patterns often emerge during this process, leading to a patterned layering known as pearlite due to its pearl-like appearance, or the similar but less beautiful bainite. Perhaps the most important allotrope is martensite, a chemically metastable substance with about four to five times the strength of ferrite. A minimum of 0.4 percent by weight of carbon is needed in order to form martensite. When the austenite is quenched to form martensite, the carbon is "frozen" in place when the cell structure changes from FCC to BCC. The carbon atoms are much too large to fit in the interstitial vaccancies and thus distort the cell structure into a Body Centered Tetragonal (BCT) structure. Martensite and austenite have an identical chemical composition. As such, it requires extremely little thermal activation energy to form. The heat treatment process for most steels involves heating the alloy until austenite forms, then quenching the hot metal in water or oil, cooling it so rapidly that the transformation to ferrite or pearlite does not have time to take place. The transformation into martensite, by contrast, occurs almost immediately, due to a lower activation energy. Martensite has a lower density than austenite, so that the transformation between them results in a change of volume. In this case, expansion occurs. Internal stresses from this expansion generally take the form of compression on the crystals of martensite and tension on the remaining ferrite, with a fair amount of shear on both constituents. If quenching is done improperly, these internal stresses can cause a part to shatter as it cools; at the very least, they cause internal work hardening and other microscopic imperfections. It is common for quench cracks to form when water quenched, although they may not always be visible. At this point, if the carbon content is high enough to produce a significant concentration of martensite, the result is an extremely hard but very brittle material. Often, steel undergoes further heat treatment at a lower temperature to destroy some of the martensite (by allowing enough time for cementite, etc., to form) and help settle the internal stresses and defects. This softens the steel, producing a more ductile and fracture-resistant metal. Because time is so critical to the end result, this process is known as tempering, which forms tempered steel. Other materials are often added to the iron-carbon mixture to tailor the resulting properties. Nickel and manganese in steel add to its tensile strength and make austenite more chemically stable, chromium increases the hardness and melting temperature, and vanadium also increases the hardness while reducing the effects of metal fatigue. Large amounts of chromium and nickel (often 18 percent and 8 percent, respectively) are added to stainless steel so that a hard oxide forms on the metal surface to inhibit corrosion. Tungsten interferes with the formation of cementite, allowing martensite to form with slower quench rates, resulting in high speed steel. On the other hand, sulfur, nitrogen, and phosphorus make steel more brittle, so these commonly found elements must be removed from the ore during processing. When iron is smelted from its ore by commercial processes, it contains more carbon than is desirable. To become steel, it must be melted and reprocessed to remove the correct amount of carbon, at which point other elements can be added. Once this liquid is cast into ingots, it usually must be "worked" at high temperature to remove any cracks or poorly mixed regions from the solidification process, and to produce shapes such as plate, sheet, wire, etc. It is then heat-treated to produce a desirable crystal structure, and often "cold worked" to produce the final shape. In modern steelmaking these processes are often combined, with ore going in one end of the assembly line and finished steel coming out the other. These can be streamlined by a deft control of the interaction between work hardening and tempering. Iron was in limited use long before it became possible to smelt it. The first signs of iron use come from Ancient Egypt and Sumer, where around 4000 B.C.E. small items, such as the tips of spears and ornaments, were being fashioned from iron recovered from meteorites (see Iron: History). About six percent of meteorites are composed of an iron-nickel alloy, and iron recovered from meteorite falls allowed ancient peoples to manufacture small numbers of iron artifacts. Meteoric iron was also fashioned into tools in precontact North America. Beginning around the year 1000, the Thule people of Greenland began making harpoons and other edged tools from pieces of the Cape York meteorite. These artifacts were also used as trade goods with other Arctic peoples: tools made from the Cape York meteorite have been found in archaeological sites more than 1,000 miles (1,600 kilometers) away. When the American polar explorer Robert Peary shipped the largest piece of the meteorite to the American Museum of Natural History in New York City in 1897, it still weighed over 33 tons. The name for iron in several ancient languages means "sky metal" or something similar. In distant antiquity, iron was regarded as a precious metal, suitable for royal ornaments. Presently iron is the most-recycled substance on the planet. Beginning between 3000 B.C.E. to 2000 B.C.E., increasing numbers of smelted iron objects (distinguishable from meteoric iron by their lack of nickel) appear in Anatolia, Egypt, and Mesopotamia (see Iron: History). The oldest known samples of iron that appear to have been smelted from iron oxides are small lumps found at copper-smelting sites on the Sinai Peninsula, dated to about 3000 B.C.E. Some iron oxides are effective fluxes for copper smelting; it is possible that small amounts of metallic iron were made as a by-product of copper and bronze production throughout the Bronze Age. In Anatolia, smelted iron was occasionally used for ornamental weapons: an iron-bladed dagger with a bronze hilt has been recovered from a Hattic tomb dating from 2500 B.C.E. Also, the ancient Egyptian ruler Tutankhamun died in 1323 B.C.E. and was buried with an iron dagger with a golden hilt. An ancient Egyptian sword bearing the name of pharaoh Merneptah as well as a battle axe with an iron blade and gold-decorated bronze haft were both found in the excavation of Ugarit. The early Hittites are known to have bartered iron for silver, at a rate of 40 times the iron's weight, with Assyria. Iron did not, however, replace bronze as the chief metal used for weapons and tools for several centuries, despite some attempts. Working iron required more fuel and significantly more labor than working bronze, and the quality of iron produced by early smiths may have been inferior to bronze as a material for tools. Then, between 1200 and 1000 B.C.E., iron tools and weapons displaced bronze ones throughout the near east. This process appears to have begun in the Hittite Empire around 1300 B.C.E., or in Cyprus and southern Greece, where iron artifacts dominate the archaeological record after 1050 B.C.E. Mesopotamia was fully into the Iron Age by 900 B.C.E., central Europe by 800 B.C.E. The reason for this sudden adoption of iron remains a topic of debate among archaeologists. One prominent theory is that warfare and mass migrations beginning around 1200 B.C.E. disrupted the regional tin trade, forcing a switch from bronze to iron. Egypt, on the other hand, did not experience such a rapid transition from the bronze to iron ages: although Egyptian smiths did produce iron artifacts, bronze remained in widespread use there until after Egypt's conquest by Assyria in 663 B.C.E. Iron smelting at this time was based on the bloomery, a furnace where bellows were used to force air through a pile of iron ore and burning charcoal. The carbon monoxide produced by the charcoal reduced the iron oxides to metallic iron, but the bloomery was not hot enough to melt the iron. Instead, the iron collected in the bottom of the furnace as a spongy mass, or bloom, whose pores were filled with ash and slag. The bloom then had to be reheated to soften the iron and melt the slag, and then repeatedly beaten and folded to force the molten slag out of it. The result of this time-consuming and laborious process was wrought iron, a malleable but fairly soft alloy containing little carbon. Wrought iron can be carburized into a mild steel by holding it in a charcoal fire for prolonged periods of time. By the beginning of the Iron Age, smiths had discovered that iron that was repeatedly reforged produced a higher quality of metal. Quench-hardening was also known by this time. The oldest quench-hardened steel artifact is a knife found on Cyprus at a site dated to 1100 B.C.E. Archaeologists and historians debate whether bloomery-based ironworking ever spread to China from the Middle East. Around 500 B.C.E., however, metalworkers in the southern state of Wu developed an iron smelting technology that would not be practiced in Europe until late medieval times. In Wu, iron smelters achieved a temperature of 1,130 °C, hot enough to be considered a blast furnace. At this temperature, iron combines with 4.3 percent carbon and melts. As a liquid, iron can be cast into molds, a method far less laborious than individually forging each piece of iron from a bloom. Cast iron is rather brittle and unsuitable for striking implements. It can, however, be decarburized to steel or wrought iron by heating it in air for several days. In China, these ironworking methods spread northward, and by 300 B.C.E., iron was the material of choice throughout China for most tools and weapons. A mass grave in Hebei province, dated to the early third century B.C.E., contains several soldiers buried with their weapons and other equipment. The artifacts recovered from this grave are variously made of wrought iron, cast iron, malleabilized cast iron, and quench-hardened steel, with only a few, probably ornamental, bronze weapons. During the Han Dynasty (202 B.C.E.–220 C.E. ), Chinese ironworking achieved a scale and sophistication not reached in the West until the eighteenth century. In the first century, the Han government established ironworking as a state monopoly and built a series of large blast furnaces in Henan province, each capable of producing several tons of iron per day. By this time, Chinese metallurgists had discovered how to puddle molten pig iron, stirring it in the open air until it lost its carbon and became wrought iron (in Chinese, the process was called chao, literally, stir frying). Also during this time, Chinese metallurgists had found that wrought iron and cast iron could be melted together to yield an alloy of intermediate carbon content, that is, steel. According to legend, the sword of Liu Bang, the first Han emperor, was made in this fashion. Some texts of the era mention "harmonizing the hard and the soft" in the context of ironworking; the phrase may refer to this process. Perhaps as early as 300 B.C.E., although certainly by 200 C.E., high quality steel was being produced in southern India also by what Europeans would later call the crucible technique. In this system, high-purity wrought iron, charcoal, and glass were mixed in crucibles and heated until the iron melted and absorbed the carbon. 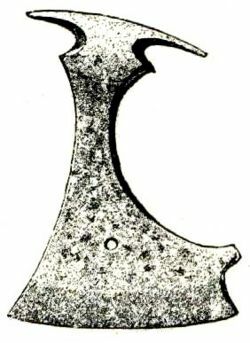 One of the earliest evidence of steel making comes to us from Samanalawewa area in Sri Lanka where thousands of sites were found (Juleff 1996). In the early seventeenth century, ironworkers in Western Europe had found a means (called cementation) to carburize wrought iron. Wrought iron bars and charcoal were packed into stone boxes, then held at a red heat for up to a week. During this time, carbon diffused into the iron, producing a product called cement steel or blister steel (see cementation process). One of the earliest places where this was used in England was at Coalbrookdale, where Sir Basil Brooke had two cementation furnaces (recently excavated). For a time in the 1610s, he owned a patent on the process, but had to surrender this in 1619. He probably used Forest of Dean iron as his raw material. From the sixteenth to the eighteenth century, most iron was made by a two-stage process involving a blast furnace and finery forge, using charcoal as fuel. Production was limited, however, by the supply of wood for making charcoal. By the eighteenth century, deforestation in Western Europe was making ironworking and its charcoal-hungry processes increasingly expensive. In 1709 Abraham Darby began smelting iron using coke, a refined coal product, in place of charcoal at his ironworks at Coalbrookdale in England. Although coke could be produced less expensively than charcoal, coke-fired iron was initially of inferior quality compared to charcoal-fired iron. It was not until the 1750s, when Darby's son, also called Abraham, managed to start selling coke-smelted pig iron for the production of wrought iron in finery forges. Another eighteenth century European development was the invention of the puddling furnace. 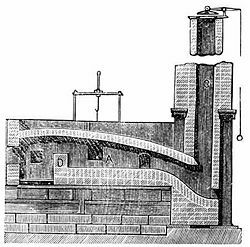 In particular, the form of coal-fired puddling furnace developed by the British ironmaster Henry Cort in 1784 made it possible to convert cast iron into wrought iron in large batches (without charcoal), rendering the ancient finery forge obsolescent. Wrought iron produced using this method became a major raw material in the English midlands' iron manufacturing trades. The problem of mass-producing steel was solved in 1855 by Henry Bessemer, with the introduction of the Bessemer converter at his steelworks in Sheffield, England (an early converter can still be seen at the city's Kelham Island Museum). In the Bessemer process, molten pig iron from the blast furnace was charged into a large crucible, and then air was blown through the molten iron from below, igniting the dissolved carbon from the coke. As the carbon burned off, the melting point of the mixture increased, but the heat from the burning carbon provided the extra energy needed to keep the mixture molten. 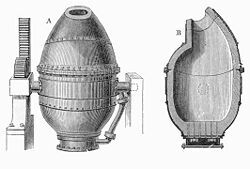 After the carbon content in the melt had dropped to the desired level, the air draft was cut off: a typical Bessemer converter could convert a 25-ton batch of pig iron to steel in half an hour. Until these nineteenth-century developments, steel was an expensive commodity and only used for a limited number of purposes where a particularly hard or flexible metal was needed, as in the cutting edges of tools and springs. The widespread availability of inexpensive steel powered the second industrial revolution and modern society as we know it. Mild steel ultimately replaced wrought iron for almost all purposes, and wrought iron is not now (or is hardly now) made. With minor exceptions, alloy steels only began to be made in the late nineteenth century. Stainless steel was only developed on the eve of World War I and only began to come into widespread use in the 1920s. These alloy steels are all dependent on the wide availability of inexpensive iron and steel and the ability to alloy it at will. Steel is currently the most-recycled material in the world, the industry estimates that of new metal produced each year some 42.3 percent is recycled material. All steel that is available is currently recycled, the long service life of steel in applications such as construction means that there is a vast store of steel in use that is recycled as it becomes available. But new metal derived from raw materials is also necessary to make up demand. Alloy steels were known from antiquity, being nickel-rich iron from meteorites hot-worked into useful products. In a modern sense, alloy steels have been made since the invention of furnaces capable of melting iron, into which other metals could be thrown and mixed. 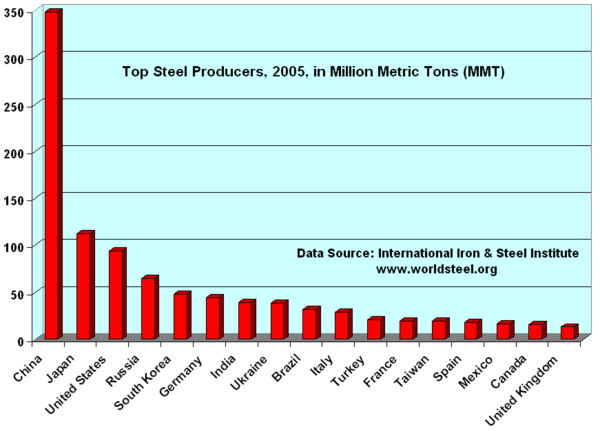 Carbon steel is composed simply of iron and carbon accounts for 90 percent of steel production. HSLA steels (high strength, low alloy) have small additions (usually less than two percent by weight) of other elements, typically 1.5 percent manganese, to provide additional strength for a modest price increase. Low alloy steel is alloyed with other elements, usually molybdenum, manganese, chromium, or nickel, in amounts of up to ten percent by weight to improve the hardenability of thick sections. Stainless steels and surgical stainless steels contain a minimum of ten percent chromium, often combined with nickel, to resist corrosion (rust). Some stainless steels are nonmagnetic. Tool steels are alloyed with large amounts of tungsten and cobalt or other elements to maximize solution hardening, allow precipitation hardening and improve temperature resistance. Cor-ten and related steels weather by acquiring a stable, rusted surface, and so can be used unpainted. Hadfield steel (after Sir Robert Hadfield) or manganese steel, this contains 12 to 14 percent manganese which when abraded forms an incredibly hard skin which resists wearing. Some examples are tank tracks, bulldozer blade edges and cutting blades on the jaws of life. Though not an alloy, there exists also galvanized steel, which is steel that has gone through the chemical process of being hot-dipped or electroplated in zinc for protection against rust. Finished steel is steel that can be sold without further work or treatment. TMT Steel (thermo-mechanically treated steel) is one of the latest developments in the history of steel. The steel manufacturing process is improved and thereby the properties of this steel to suit RCC construction work has been achieved. The steel wires are passed through cold water just after drawing from the extruder. This helps in rapid cooling of the skin and heat starts flowing from the center to the skin once the wire is out of the water. This acts as a heat treatment. The relatively soft core helps in ductility of the steel while the treated skin has good weldability to suit construction requirements. Steel was expensive and was only used where nothing else would do, particularly for the cutting edge of knives, razors, swords, and other tools where a hard sharp edge was needed. It was also used for springs, including those used in clocks and watches. Steel has been easier to obtain and much cheaper, and it has replaced wrought iron for a multitude of purposes. Steel is often used in the production of fasteners, such as nuts and bolts; either zinc-plated or stainless steel are most common. Steel continues to be widely-used, though the new availability of plastics during the twentieth century has meant that it has ceased to be used for some smaller applications that require less durability or demand a lower mass. ↑ 1.0 1.1 1.2 1.3 1.4 Michael F. Ashby and David R. H. Jones (1986), Engineering Materials 2 (Oxford: Pergamon Press, 1992, ISBN 0080325327). ↑ E. J. Mittemeijer and J. T. Slycke, “Chemical potentials and activities of nitrogen and carbon imposed by gaseous nitriding and carburising atmospheres,” Surface Engineering 12(2) (1996): 156. Retrieved August 7, 2007. This page was last modified on 21 October 2015, at 15:53.